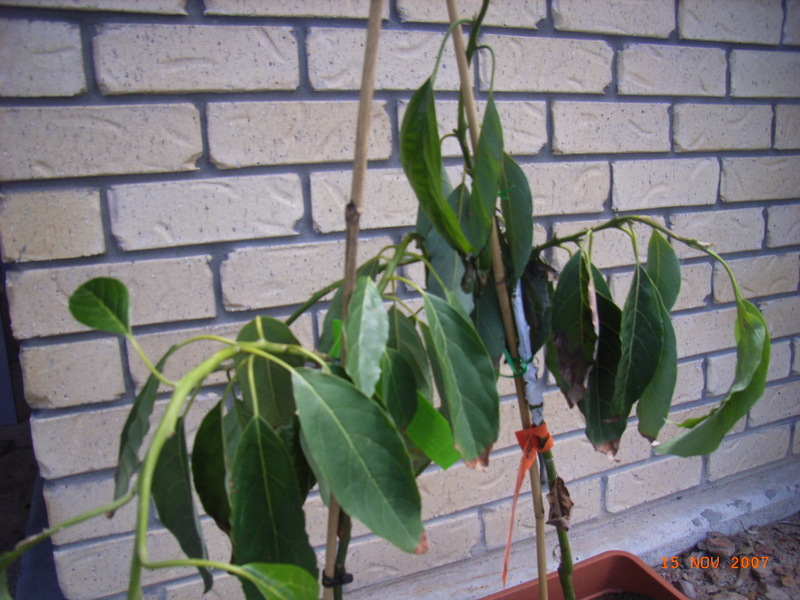 Forum: Avocado Trees Dying! HELP! We purchased two avocado trees from Daleys about a month ago. Unfortunately, the day after we put them in the ground, we had a huge storm, flooding the trees. They started to go limp. We called Daleys and were told they had received too much water. The ground was still very wet, so we put the trees back into pots to try to dry them out. It has now been about 3 weeks and they are not improving. Does anyone have any suggestions on what to try to keep them alive? What have you repotted them into? They are very fussy about drainage, they need a well drained potting mix, have you used this or your soil? We would recommend you put them into a shade house until they recover or are established. Even when planted into the ground they will need a little shade structure around them to protect those beautiful green stems from sunburn. Too much sun now will only set your trees back even more. Four star pickets or tomato stakes and some shade cloth around it will certainly help to prevent them from being cooked. Do a drainage test of you soil. Dig a hole, fill with water and time how long it takes to drain away, this is best done when the soil is moist after rain. If it is longer than 15 minutes you will need to mound your planting site, adding lots of organic matter and compost to enrich the soil and improve drainage. Avocados have lots of surface roots so you will looking to get these growing into the mound above ground level. 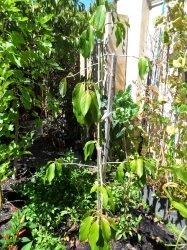 Avocados are the hardest tree to grow out of all our fruit trees, they are fussy and like a prepared site and they will not accept anything less than perfect drainage. In their natural environment avocados have surface roots that breath just below the surface of the soil, they naturally grow in the rainforests of South America where they are establish under a canopy into decomposed organic matter. It is important to remember this when planting avocados in your orchard and try to replicate these soil conditions. Eventually, we thought that it was succumbing to root rot so we tried something drastic (we didn't think that we had anything too loose, it so terrible). We pulled it out of the large pot and washed much of the soil from its roots. It was then that we discovered when it came from the shop it was potted in a black, sticky clay-like sand which was very wet. Washing that off the roots was quite hard, but I tried to be gentle. I also cut off as much of the rotted roots that I could. We then repotted it (potting mix) into a medium sized pot, sprinkling rooting hormone on the roots to encourage them to grow. We watered it thouroughly and removed all the flowers. When it had finished draining we brought it inside, out of the wind, to a north-facing window. We didn't need to water it for about 3 weeks. Slowly, the old leaves dried up and fell off, and a new crop of leaves came in and grew to full size. We kept watering it every few weeks or so, and for the first couple of waters we added a bit of rooting hormone. It is now looking better than when we first brought it home, but I am not planning on moving it outside until after summer, as I don't think that it is yet able to withstand the heat. 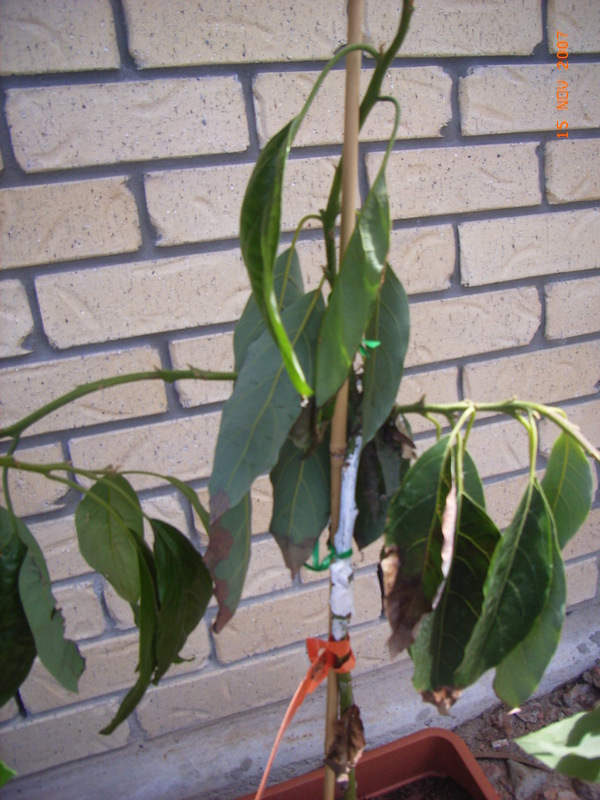 We were initially concerned that it had phytophthera root rot, to which avocados are very susceptible. I added some calcium to the soil (finely ground egg shells) as I had read that this inhibited the fungus. However, the root rot had a different pattern (there is a NSW agfact), and the leaves grew back to the normal size which indicates that it was some other root rot. 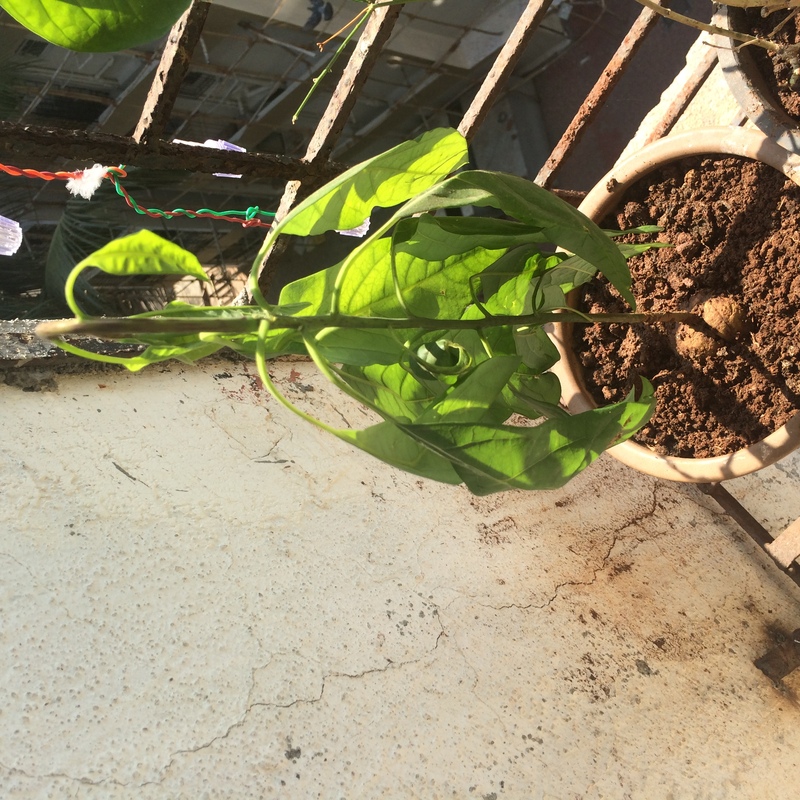 I bought an avocado tree 10 months ago, and planted it in the ground and i have not luck with it. 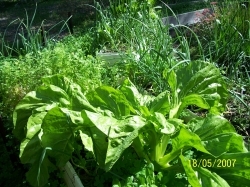 It has not gotten taller, the tips of the leaves tend to go brown. It usually gets the afternoon sun. I had a suggestion that it was not getting enough water and too much sun so i had put stakes around it with a hesson bag as shade and have put bottles [with the bottoms cut off, to act like funnel or dripper into the soil] in the soils to pour water into to ensure that it gets enough water. But have not noticed any changes, it anything i think that it is getting worse - with some of the leaves falling off. Oh and it gets fertiliser - sheep manure. Any suggestions???? THanks for that info... yes nothing worked with this one. Unfortunately it died. I now have a wurtz, which i put in a huge pot so i could move it around in the summer and winter. THe leaves got all brown during the winter, i am hoping this will sort its self out, as the new leaves comes. Appart from that, this one seems to be going ok, but we shall see if this is still the case after the summer. 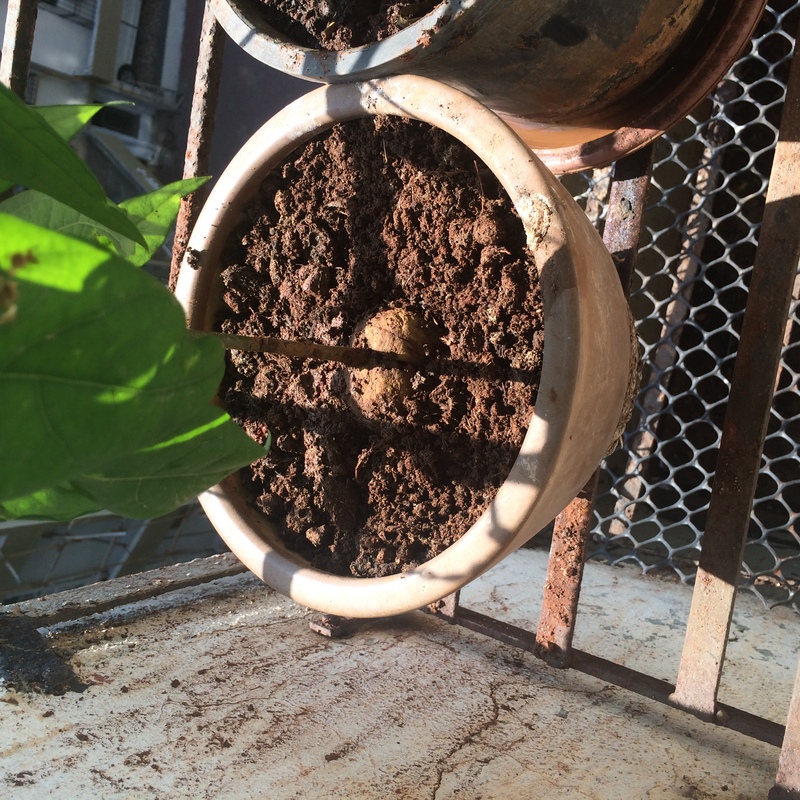 18 months ago, I planted a Hass avocado - the soil is heavy, with a clay sub-structure, so I planted in a raised mound, with plenty of compost,added dolomite and gypsum (dug gypsum into the original soil before mounding over the top), it took 6 months, but it died. I replanted with the same in the following spring. It's about 7 months old and is now going the same way - the leaves blacken off and die. It has always had a shade cloth around it - I removed this about a month ago, as I thought perhaps it needed more sunlight due the the big wet - but it's still looking very sad - any ideas? 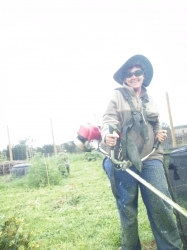 Improving soil to improve drainage and organic matter, putting shade cloth around it, adding calcium - all of this are good things for avocados. The only thing I would add to give best chances are spraying it with Phosphite, which is a sort of immune booster and protection against Phytophthora. Spray with Yates Antirot . It is a phosphonate fungicide active against phytophthora ;no guarantees though. 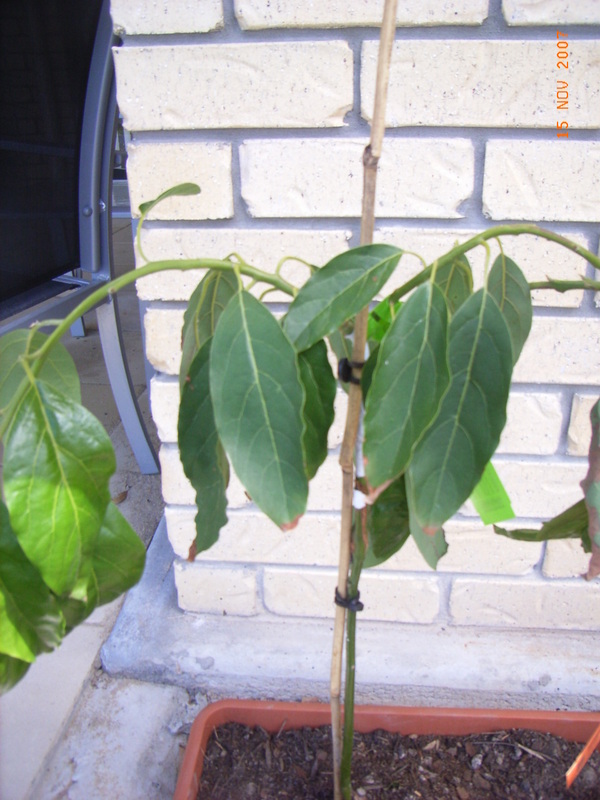 Phytophthora cinnamomi is the most common cause of Avocado tree loss, if the decline of the tree should be caused by a root attack. Glad to hear Paul. The phosphite treatment will last for a while. Maybe spray again this coming autumn. Unfortunately, if it is P. cinnamomi, it will only be suppressed however not killed, but in addition with your effort on drainage, plenty of organic matter, etc. you have a good chance to manage it. ...as a tonic to allow the tree to grow through the infection rather than as a classic fungicide like copper oxy.If it is serious trunk injections can be used.The fungi will still be there but loads of mulch,organic ferts,P and K with good drainage can suppress it.Dig out and seal cankers if they come out and practice good hygiene so youminimise its spread. the posting was a response to anne, Perth on the 29th of Dec, but would also apply to other people being in similar situations now or in future. So how are you doing - have you planted other avocados for replacement? Do you have now plants in these spots, which ones and how they are doing? I was told "U either have Avocado-soil or U don't - it's that simple". I haven't been game to try them again here. I would even go out on a limb here and say that I don't think they are for novices - if they don't have the "right" conditions...? The seed sprouted a couple of weeks later, and I got leaves!! I was soooo happy that it grew! 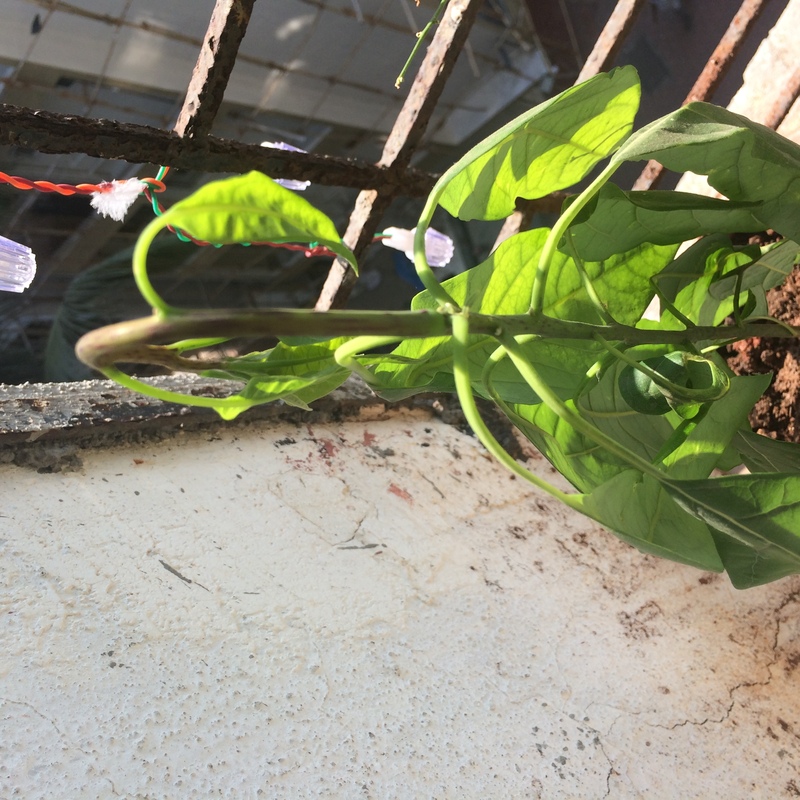 Today, about a month or so later, it has about 10-12 leaves and I thought to transplant it into a bigger pot, looking at the size of the leaves. 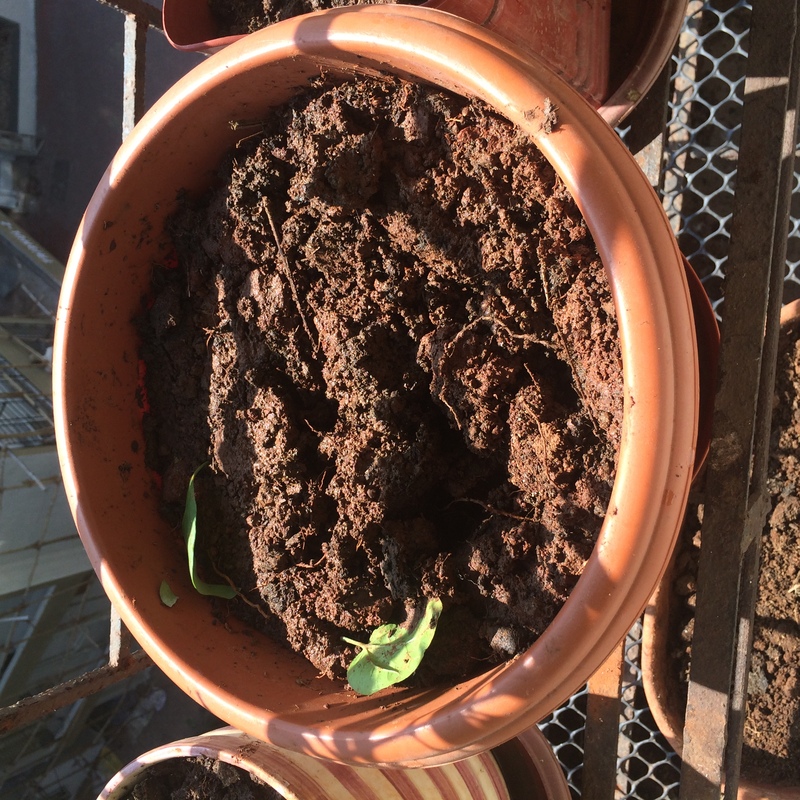 I put it in a big pot and buried the seed into the soil, and within 10 min, all the leaves drooooped!! I got soo worried and looked up diff forums, unsure whether the seed should be buried under the soil or still peeking out? I panicked after a half hour and no change in the leaves, so put the whole plant back into the smaller pot with the seed peeking out !! I'm in India, so the weather right now is quite sunny and cool, December winters in Bombay do not get cold at all! Looks very like a Tamarillo to me - they don't like too much sun unless the weather is cold. You guys gone blind on me?. Looks like an Avocado from here, one grown inside sure. Its just sulking from root dustubance. I'd put a plastic bag over it until it recovers, then rip the bag and remove it totally some days/weeks later. That's what I have to do when I transplant them bare rooted. Its transplant shock. Water lightly as avo dont like wet feet, and i would mist the plants leaves. Depending on damage, it will prob take a week before you see signs of recovery. Your seedling will be losing some leaves but if the plant has reserve energy, new buds will emerge. Just dont expect the plant will spring back to the way it was. Good luck.